R is a young man with an existential crisis--he is a zombie. He shuffles through an America destroyed by war, social collapse, and the mindless hunger of his undead comrades, but he craves something more than blood and brains. He can speak just a few grunted syllables, but his inner life is deep, full of wonder and longing. He has no memories, no identity, and no pulse, but he has dreams.After experiencing a teenage boy's memories while consuming his brain, R makes an unexpected choice that begins a tense, awkward, and strangely sweet relationship with the victim's human girlfriend. Julie is a blast of color in the otherwise dreary and gray landscape that surrounds R. His decision to protect her will transform not only R, but his fellow Dead, and perhaps their whole lifeless world. Confession: I saw the movie before reading the book. Honestly, I'm glad I did. In my opinion, the book and the movie have two completely different feels. Seeing the movie first allowed me to just sit back and enjoy it with no expectations, and enabled me to be able to keep the book and the movie in completely separate vaults. In the end, they both deliver the same message, but the movie does it in a funnier way. Like I said, though, I am able to keep the movie and the book in separate vaults, so here are my thoughts on the book. I had a hard time connecting to any of the characters, really. R is a great narrator, but he's also a zombie--incapable of real memories, and true feelings. It makes it hard to connect to him when all one really knows about him is his present: he likes to collect thing, he lives in a plane, he likes to listen to old records. There's no trauma, no experiences, no fear: all the basic building blocks that make up a person. I think he is a character people can relate to because his desire for more is obvious in every thought.You can hear it, but you can't really feel it. Or at least I couldn't. I couldn't feel any of R's "feelings" because they're not really feelings, they're acknowledgements of feelings. And with Julie...I don't know. I just don' know why the connection wasn't there. She kind of annoyed me, but it was more than that. She felt flat. The relationship between R and Julie was not the greatest, not the most dynamic, not the most heart-stopping...but I still liked it. It was a zombie and a human and I thought it was cute. Sure, R had no reason to fall for Julie besides that he saw her in Perry's memories. Still, I enjoyed the romantic aspect of this book. So, in my opinion, zombies are pretty hard to pull off. Marion's zombie lore has some good stuff and some bad stuff. I loved the wedding, and "church", the bonies. It adds a little more depth to the classic "me heart brains" idea of zombies. However, even with that added layer, there were still some things I found a little unbelievable. Little inconsistencies and holes that prevented me from fully surrendering to the world Marion created. The story itself progressed quite nicely, though. There were a few times when I was like, "Okay. Enough of this random fluff. Get on with the story!" All in all, though, I think the pacing was decent and it got a lot better toward the end. There wasn't an abundance of action, but Marion does the action pretty well. All in all, Warm Bodies isn't the most incredible book I've ever read. The writing is a bit literary and it's pretty fluffy for a zombie book. But I certainly do not regret reading this. I wouldn't recommend it to everyone, only those who are mature enough to deal with the obvious message in this book, told with a zombie disguise. I feel like I gained a little nugget of...something from reading this book. And I don't know how to describe that nugget to anyone who hasn't also gained it. 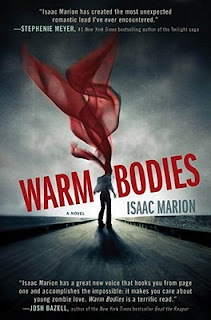 Reviews for WARMS BODIES have been everywhere lately! I'm glad you enjoyed this overall, Gabbi. I haven't read the book yet, but the thing I'm most frightened off is how the relationship part will be portrayed. Disappointed that it wasn't anything particularly different for you, since - a ZOMBIE and a HUMAN. I would have expected a little more BANG, but I'm glad that you still found the romance sweet and cute. :) I'm intrigued to see what this "message" you talked about is!